Given by the Rector and Churchwardens of the Parish of Eastwell with Broughton Aluph. This monument is one of a series commemorating members of the Finch family; it was erected after the death of Sir Moyle Finch, but during the lifetime of Lady Elizabeth Finch, who became Viscountess Maidstone in 1623, and then Countess of Winchilsea in 1628. The names of their twelve children are inscribed round the base; the monument to their fourth son, Heneage, is displayed nearby. Other monuments to members of the Finch family once in St Mary's Church, Eastwell, Kent, are now housed in the V&A. The church sadly fell into disrepair and collapsed in the 1960s, but the monuments were rescued and brought to the Museum at that date. 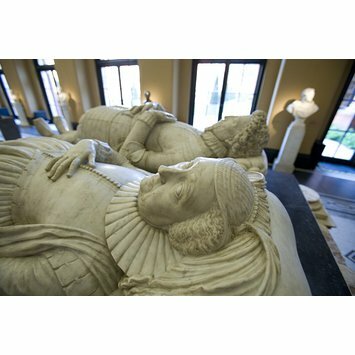 In addition two busts of great-grandsons of Sir Moyle and Lady Finch, Daniel Finch and his brother, Canon Edward Finch, are also displayed in the V&A. Originally this monument had a canopy with inscriptions and a giant heraldic griffin, supported by eight marble columns; this was taken down in 1756 as it was thought to be in danger of collapsing. The bases of the columns can be seen around the edge of the bier on which the figures lie. A 17th-century drawing showing the canopy exists in the Library of the Society of Antiquaries. A wide base originally extended around the bier, but this is currently not on display. Nicholas Stone (1586/7-1647) was the foremost British sculptor of his day, and was trained in the Netherlands, where he learned the art of carving marble. With the onset of the Civil War in 1642 he evidently ceased working, and the sculptural tradition in Britain generally was not revived again until the late 17th century. Stone's notebook and account book survive, and are held at Sir John Soane's Museum in London. 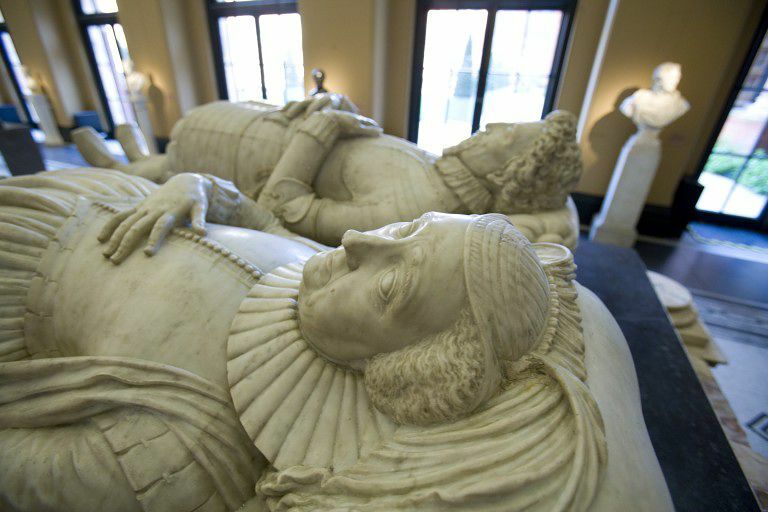 Monument to Sir Moyle Finch and to Elizabeth Countess of Winchilsea, marble and alabaster. Alabaster tomb-chest standing on a wide pavement of touch and white marble (with two semi-circular lobes on the longer sides), in which can be seen the sockets for a wooden railing which once surrounded the tomb. On top is a bier supporting two recumbent effigies in white Carrara marble. The male effigy is in armour, with a sword (part missing) at his left. He has a square-cut beard, his eyes are closed and his hands rest on his stomach. The female effigy, with open eyes, wears a coif, with a veil, a falling ruff, and a gown over a ssimple dress. The bodice has a row of buttons and tabs at the waist. The head of each effigy rests on a cushion. The tomb chest is decorated with panels of serpentine which have badly deteriorated (not due to exposure after the collapse of the church roof), and on its top, surrounding the effigies, are the bases of eight columns, which formerly supported a canopy. Given by the Rector and churchwardens of Eastwell with Boughton Aluph. Williamson, Paul, ed. European Sculpture at the Victoria and Albert Museum. London: Victoria and Albert Museum, 1996. p.191. Dynasties: Painting in Tudor and Jacobean England 1530-1630, (exhibition catalogue), Tate Gallery, London, 1995, pp. 179-80, cat. no. 122. Esdaile, K.A. 'Notes on three monumental drawings from Sir Edward Dering's Collection in the Library of the Society of Antiquaries', Archaeologica Cantiana, XLVII, 1935, pp. 219-234. Victoria and Albert Museum Bulletin, II, 1970, p. 131-135.